The unicorn look can be pulled off in a few different ways. First you need your horn. The mask seen here comes in silver, gold, and white. If you want something cheaper and DIY, try rolling poster board in a triangle and covering with tinfoil or wrap braided trim around it. Then use some elastic to secure to your head or hot glue it to a headband. Next, find a dress. 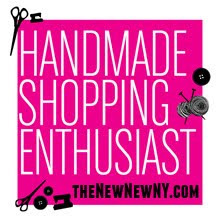 You may have something in your closet already or you can try hitting up the thrift store. I'd suggest a white, silver, and/or black color scheme (Seen above: Black/Silver, Silver, White). Add some chunky shoes or boots (hooves) and you're pretty much good to go. You can accessorize with a wig (or metallic/sparkly hair spray), metallic or faux fur items, and don't forget to finish the look with some glitter/shimmer make-up. Now go find your inner unicorn! 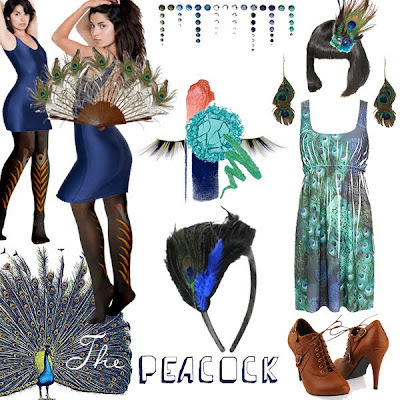 The most important aspects of the peacock look are a blue dress and some type of peacock feather accessory. You can buy an outfit with a peacock pattern already on it, or get more realistic by taking a hand fan, gluing peacock feathers to it, and attaching it to your back by tying some type of string from the bottom and top of the fan around your waist. For your head, you can buy a premade headband or easily make one yourself with the hot glue. A simple and fun look to pull off! Seen above: dark blue american apparel dress, patterned forever 21 dress, tights, shoes, headband, earrings, hairclip, wig, and make-up. Next up we have The Pumpkin. This look is pretty easy to pull off. First of all, you'll need an orange shirt. You can buy one on Etsy like the one above, or DIY. Pumpkin faces are pretty simple to draw and it's Halloween, it doesn't need to be perfect! So just get out some black paint or a sharpie and you're good to go. Next, you'll need some type of leggings. If you're afraid to break out the shiny/sequin trend in your normal day life, why not try it out for Halloween? (Seen Above: Sequin, Shiny Black, Shiny Copper). Accessorize with a green headband like the Etsy ones seen above (leaf, scroll). Hit up a craft store and buy some fake vines to interwine throughout your costume, wherever you see fit. Finish it off with some green eyeshadow, sparkly black eyeliner, and some jewelry such as the copper cuff bracelet seen above. Lastly, treat yourself to some pumpkin pie. I love your ideas for the peacock! I've been looking everywhere for a fan, where did you find yours??? Thanks!